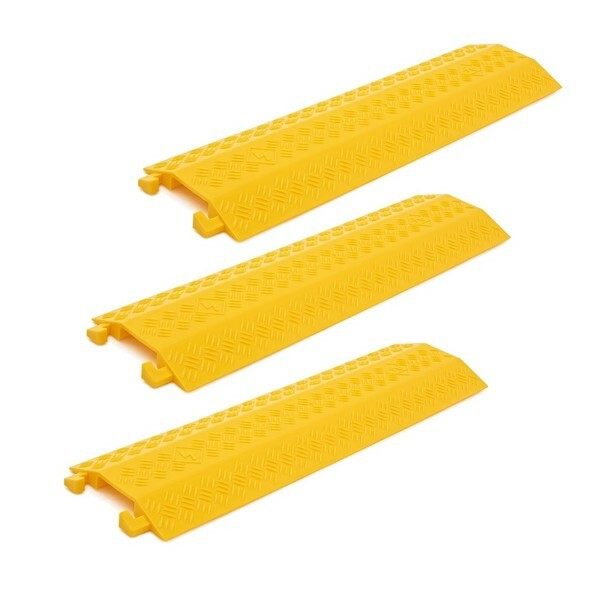 The Medium Cable Covers by Gear4music is a pack of 3 pedestrian cable protectors that are suitable for indoor and outdoor usage, with an extension system to safely connect multiple covers. The flexible Polyurethane (PU) construction reduces trip hazards, and provides a non-slip surface. This cable covering is high visibility, making it ideal for offices, venues and outdoor events. The Medium Cable Cover by Gear4music is a durable pedestrian cable protector constructed in a high visibility yellow Polyurethane (PU). Designed to reduce trip hazards with a raised non-slip surface, this cover is suitable for carpeted or hard floor venues as well as outdoor uses. This cable cover by Gear4music is easy to set up - just fit the cabling into the slot underneath and link any additional covers onto the dedicated connection system.